The LG G Flex 2 is the successor to the curvy LG G Flex, which was an interesting phone let down by a pretty bad display, a rubbish camera and a ridiculously high price tag. The new Flex 2 is the first phone to ship with a 64-bit Snapdragon 810 processor, the display’s amazing and the camera is better too - but can it compete with the current Android standard bearer, the Nexus 6? Let’s find out in our LG G Flex 2 vs Nexus 6 comparison. The unique selling point of the G Flex 2 is of course that curved shape: LG is currently the only firm deliberately making curved and flexible smartphones. This second generation model has a stronger shell, a slightly smaller size and “self healing” rear bodywork that promises to vanish scratches in just 10 seconds. The display is tougher too, with “Dura-Guard” glass that’s a coated form of Gorilla Glass. The Nexus 6 looks like a Motorola, because of course it is. It’s a bigger version of the Moto X 2014 with a water-resistant body and an elegant appearance: where previous Nexuses were fairly chunky the 6 is slim and good looking in both white and dark blue. The G Flex 2 display has been upgraded from its predecessor, but it’s a little bit smaller too. It’s a 5.5-inch P-OLED screen running at 1920 x 1080 pixels. That’s 401 ppi. The Nexus has the better screen here: it’s both bigger and more densely packed, with its 5.86-inch QHD display delivering 515 ppi. Resolution is 2560 x 1440 pixels. It’s darker than many rivals, though, and we noticed a slight pink hue at the lowest brightness settings. The G Flex 2 comes with Android Lollipop 5.0.1. As you’d expect from a Nexus, it’s got the latest version of Android too. The G Flex 2 comes with a speedy 64-bit Snapdragon 810 processor, but we’re a bit worried by the accompanying RAM: if you go for the 16 GB model there’s just 2 GB of RAM on board, which may not be enough to get the most from that processor. The 32 GB model has more RAM: 3 GB. Although the Nexus’s Snapdragon 805 processor is described as 64-bit it’s based on the 32-bit ARMv7 architecture, so it’s really the last gap of the 32-bit Androids. It’s a fast quad-core processor but we found it stuttered a bit with HD gaming. The G Flex 2 has a 13 MP rear camera with optical image stabilization and a 2.1 MP front camera, while the Nexus has 13 MP on the back and 2 on the front. LG’s phones have a reputation for long battery life, and the improved efficiency of the Snapdragon processor means that its 3000 mAh battery should last even longer than before. The Nexus has a bigger battery - 3220 mAh - but its processor is 32-bit with four fairly hungry cores, plus of course it’s driving a bigger screen. We’d still expect all-day battery life but we think the LG should have the edge here. The G Flex 2 has been announced but isn’t on sale yet, but LG tells us that the price will be similar to the price of the original G Flex - so that should be around $650 SIM-free. The Nexus starts at $649 for the 32 GB model, rising to $699 for 64 GB. 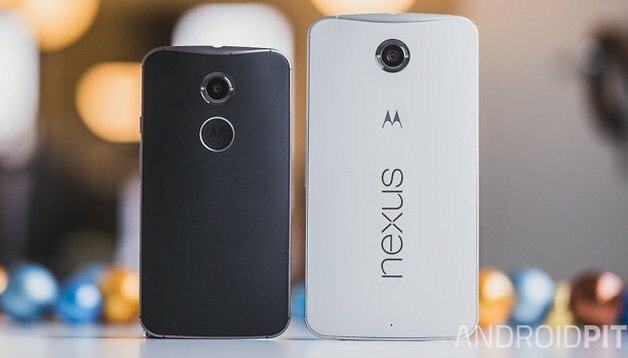 With the Nexus 6, Google moved upmarket: previous Nexuses were as cheap as they were cheerful, and their goal was to gain market share. Now that Android is everywhere Google is focusing on money rather than market share, and the Nexus 6 is a largely successful attempt to make a flagship phone. It’s nicely made with good speakers, camera and battery, although you might not like the comparatively dark display. Is the LG better? That’s a tough one. It has the better processor and should edge it on battery life, and if you’re not a fan of phablet-sized phones then it’s a lot more pocket-friendly than the rather large Nexus. Ultimately though there’s very little difference between the two phones - even the prices are similar - so the choice is likely to come down to personal preference and whether you can get a good deal. We suspect there will be decent discounts on the G Flex 2 if you’re willing to be a little bit patient. Is it too close to call, or do you think there’s a clear winner here? Let us know in the comments! I like my nexus 6 . I don't think that the curved screen will fit in your pocket. And you will not get a pouch to fit it. The 810 is rumored to have problems with over heating.